Createspace Independent Publishing Platform, 9781539145677, 410pp. Blake Meyers dreamed of a peaceful end to a dutiful career with the FBI. Married now, his life was taking him in a new direction-a desk job. He would be an analyst. Ride it out until retirement. Be safe so he could enjoy family life. But when a notable member of the IRA is murdered in his London flat, Blake's secretive past propels him into the middle of an international scheme so twisted and sadistic, it will take everything Blake possesses-all of it-to save the United States from a diabolical terrorist attack. C. KEVIN THOMPSON is an ordained minister, having served churches in New York, Mississippi, Texas, and Iowa. He holds a B.A. in Bible from Houghton College (New York), an M.A. in Christian Studies from Wesley Biblical Seminary (Mississippi), and an M. Ed. in Educational Leadership from National-Louis University (Illinois). Kevin is married to Cindy, his wonderful wife of over 35 years, and they have three daughters, two sons-in-law, five grandchildren, and a rescue dog named Leo. He speaks in churches on occasion, presently works as an assistant principal in a local school district, and plays the drums in his church's praise team. He is a huge fan of The Blacklist, Blue Bloods, 24, and Criminal Minds, loves anything to do with Star Trek, and is a Sherlock Holmes fanatic. In addition to the first edition of this book, his previously published works include his debut novel, The Serpent's Grasp, winner of the Blue Ridge Mountains Christian Writers Conference 2013 Selah Award for the First Fiction Category. He is a regular contributor for Seriously Write, a Christian blog for writers. He also writes a blog twice a year for American Christian Fiction Writers (ACFW) and contributes articles from time to time for More to Life Magazine (Munce Group). He is a member of ACFW, the Christian Authors Network (CAN), and Word Weavers International (presently serving as a chapter president). His next novel, Triple Time, Book 2 in the Blake Meyer series, is coming soon! 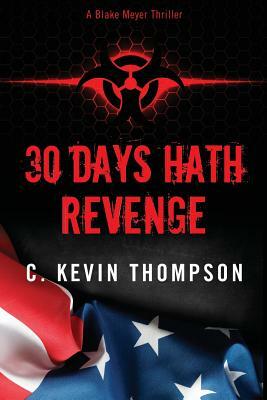 You can visit Kevin @ www.ckevinthompson.com, and while there, don't forget to join his mailing list to stay updated on his latest publications!